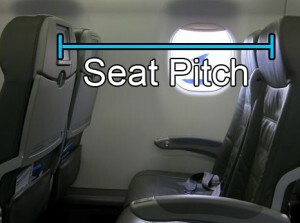 It doesn’t look like much – just a few inches – but it can make a huge difference to your comfort on the next flight. Airlines have realised that too – as they continue to squash bums into seats they have realised that those few little inches have become a money making option. So what does it cost to upgrade to premium economy? Well it is going to depend on your airline and route – just recently I paid around $200 extra for my KLM flight (that’s per segment) going overseas. On multiple segment international itineraries you may find the upgrade costs could mount up to over $1800 per person. So booking a premium economy seat is OK if you can afford it – if you can’t you may end up stuck next to a larger person who is pretty much enjoying your seat as well as their own. A recent court case is on the go where a traveller is suing Etihad Airlines for depriving him of his comfort on his flight and causing him back problems. It is easy to sympathise with him – also easy to sympathise with the larger person travelling on the flight. Clearly airlines are going to have to start addressing this issue. The other problem is that not all business classes are created equally. Some offer lie flat beds – other offer albeit large seats that recline a lot but still leave you crumpled in a little bundle at the end of your seat. It’s like sleeping on a hill! Another cause of concern is the charge for baggage. It’s a nice little income stream for the airlines but it is causing non stop problems on flights where passengers take “carry on” to new limits. We have all seen it. One carry on and one personal items turns into two HUGE bags. Sometimes you have to check that bag at the last minute – despite it containing fragile or valuables.